If you are a true fan of ink art and tattoos, then you will certainly enjoy this wonderful Microgaming game. The entire game is themed around tattoos which is apparent from the interface of the game, the visuals, the symbols and the bonus symbols and rounds that the game has to offer. Apart from the amazing theme of the game, the slot has a high paying setup, as instead of having paylines that players will place their stakes on, it has the 1024 ways to win format. This means that players are no longer restricted to a small number of paylines as they will have 1024 chances of claiming a payout. Players can check out the different combos and how can they win payouts by opening the payouts table of the slot by clicking on View Pays. Play Hot Ink Slot here. Players will see plenty of tattoos and ink art surrounding the reels of the game. Even the control panel’s buttons look like tattoos. The symbols include a heart shaped tattoo, a tattoo shop, ying yang fish symbol, dice tattoo, 8 balls, clovers and much more. 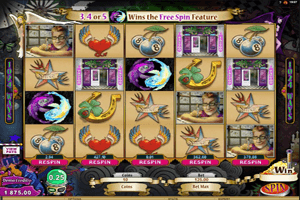 The game has a re spin feature that allows players to re spin certain reels while the remaining ones are fixed so they can manipulate the reels to earn a payout. 3 or more Tattoo bonus symbols will trigger the Tattoo Bonus round in which players will visit the Ink Shop to earn some great rewards. The logo of the game is wild and the Fish Ying Yang tattoo is the scatter symbol that activates the free spins round.